About half an hour ago I was about to put out some more food for the Ferals and I saw HTR II was perched on one of the old branches near the water dishes. I asked him to wait (as you do) and went to get some wax worms. By the time I had returned he had perched himself next to the kitchen door. Before I could properly offer them to him, HTR II was hovering next to my hand looking at the waxies as he did so. He landed next to the door step, so I dropped the wax worms next to him. He ate three and then flew off with the fourth. As he arrived at the flowering currant he was met by Mrs HTR II. He popped the wax worm into her open beak and then they disappeared into the shrubs. I figured that was it and threw a few mealies into the flowering currant for the Spadgers, who had arrived in numbers. 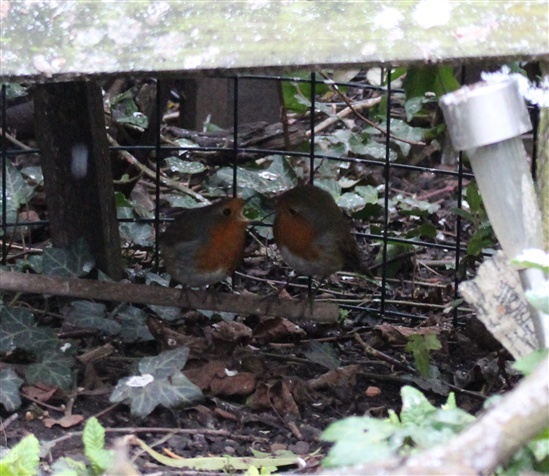 I went back indoors and just as I closed the kitchen door, both Robins appeared and went to the Chalet. I ran to get the camera and wiped the window before taking a few pics. As it happened, HTR left the Chalet at one point and returned with something for Mrs HTR II just as I was photographing her. I captured the resulting Courtship Feeding by luck rather than judgement. It is snowing here, albeit lightly. If you are watching the rugby, it's similar to the conditions there. 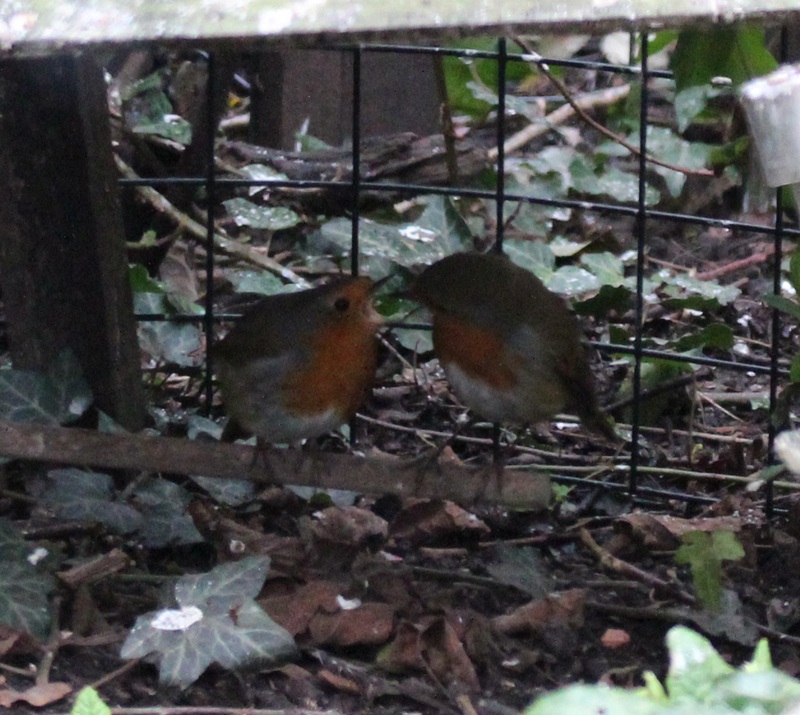 Anyway, here are the few reasonable shots I managed to get of this year's garden Robins. Hopefully they will provide me with more photo opportunities over the coming weeks and months. These will suffice as record shots at least. I have decided to make this my thread for this pair for 2018, so I have renamed it. Great to see the pair all loved up and courtship feeding lol I can already picture all the little bablets bathing in your babbling boulders ! They didn't take too long to oblige. The first one is rather acrobatic. "Love is in the air, everywhere you look around"! Brilliant bit of videoing Paul it's looking good for the new season. I have witnessed another three performances since the video clip. HTR II makes a point of perching on the branch (as in the last pic) and twarbles quietly until I give him some wax worms. I've yet to see where Mrs HTR II goes, but it seems to be in the 'new' garden. 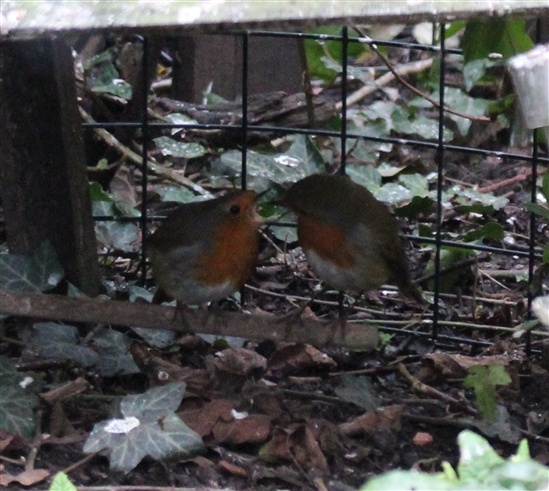 There is a Robin nesting box tucked away in the shrubs and protected by galvanised mesh. Wonderful to have seen & videoed that delightful behaviour MC, be great if they do nest in your garden! Seen my pair cavorting around but no chance of any pics, much too fast for me! 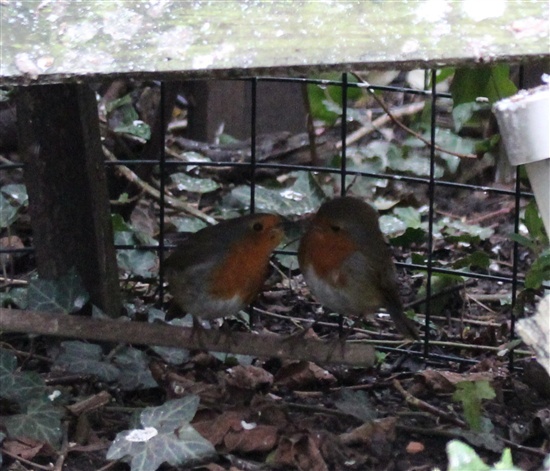 That's just lovely to watch MC, how great to have them courting in your garden, they say not many people see the courtship feeding so you are indeed privileged. I think your first photo in the Chalet is the best, look forward to more. Lovely to see that MC. Hopefully we will all have young ones in the garden? The spadgers opposite to us are nesting in one of the houses. Each time I go near the kitchen door or window, HTR II appears from the bushes and perches in the flowering currant. He then waits patiently for me to take him some wax worms. He tends to eat the first one or two and then takes the third to Mrs HTR II. He ignores the mealies that are already there and waits for wax worms. They are both well fed Robins. Hopefully that will be of benefit to any offspring they might have. Mrs HTR II appeared for a brief moment and helped herself to a couple of mealies. Clearly the waiter service was not quick enough for her. As he realised there was no danger, his feathers started to fluff out again. Mrs HTR II appears to be a first year bird. She is gradually getting used to me.